High school soccer, at it’s best, teaches young people how to be better people. The Shane Kelly Tournament commemorated a man who became great through the game. On Monday Lansdale continued unbeaten, with a 1-0 win against Archbishop Wood. St. Joes pounded McDevitt, 7-0. More importantly, on Friday they beat La Salle, finding the match’s only goal in overtime. St. Joes continues undefeated. On Wednesday, Judge lined up against La Salle in a rematch of the Catholic League championship. Judge was eager to erase the memory of a 0-3 defeat, and did so, creating a 3-0 lead before La Salle found two at the end for a 3-2 scoreline. For more on the match from a Judge perspective, check out this thorough article from the Northeast Times. The same paper also has a fun write up on Joe Hansen and Ryan Nork, best friends and “the engine” in Judge’s midfield. With this win Judge emerges as the top team in the league. On Friday, Archbishop Ryan pulled off a 2-1 over McDevitt. For other CL results, follow this link. 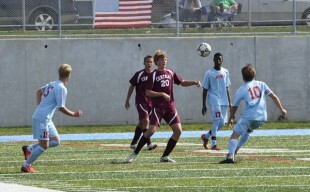 On Monday, NE scored on Central some twelve seconds into the match with a nice sixteen yard rip. Central recovered to dominate possession and create multiple chances. Central’s Jake Dillon then scored from a thirty yard free-kick, the ball skipping off the wall with enough spin and pace to dip into the goal. In the second half, play was even, with NE using a long ball approach and Central going for an on the ground approach. In the end NE hustled a goal and left Central frustrated. Central found solace on Wednesday, beating Lincoln 4-2. Philadelphia Academy Charter (PAC) lined up with Washington HS on Monday. In the first half Arthur Greenwood sent a cross into the box. Chase Nasife met the cross with his head, sending it home, and PAC had the lead. PAC keeper Mike Brown ended the game with 8 saves for the shutout. PAC finished eighth last year, not good enough for the playoffs. Their 4-0-0 start virtually guarantees a better finish this year. Coach Larry Teal said, “Our whole team has really just pulled together thus far this year. It being just my second year with the team, last year was all new and a major transition. This year, I understand the players better and they have bought into the system and the program that I run. It is great to be 4-0 but we understand there is a lot of soccer left on the table. Our goal is to make the playoffs. We’re not there yet. Until then, we will work towards that goal.” PAC has also beaten Lincoln, Fels, and Southern. Beside PAC and NE, the other undefeated team is Prep Charter. On Monday Prep Charter beat Masterman 5-1, and on Wednesday they handed their southwest Philly rival Bartram a 4-2 defeat. Southern (2-1-1), Central (2-2-0), Fels, (1-1-1), Washington (1-1-1), FTC (1-2-1), Bartram (1-2-0), Lincoln (1-3-0) are fighting it out in the middle. Still pointless are Masterman and Frankford. Palumbo and Olney lead the division with 4-0-0 records. They face off on Tuesday to decide the top team. Emerging from C-Division obscurity is Furness with a 3-1-0 record. Coach Licinio Ferreira said, “Senior Atta Ullah is the goal scorer. Currently after 4 games, he has scored 7 goals. He is constantly talking to his teammates and myself about strategies and positioning on the field during the game and directs his teammates on the field as to where they should be during the game. Emanuel Manuel is our play maker. He is quick with the ball and creates scoring opportunities constantly during the game and also scores (5 goals so far). He was last year’s C division player of the year. Lastly Kamran Khan is the leader on defense. He communicates regularly with his fellow defensive partners and is by far the most vocal and loudest player during matches. He is all over the pitch . . . The quality of the opposition this season has provided us with much tougher games . . . but that has enabled the team to work that much harder in games and practice . . . I attribute the team’s success to their willingness to show up to practice and battle just as hard as if it was game day.” Imagine what this would look like in the Premier League, with a promoted side number three in the league, after four games. The two teams relegated from A Division are not doing well, with Swenson struggling for points (0-4-0), and Boy’s Latin less than dominant at 1-2-0. Kensington scored an unanswered four goal against New Foundations Charter in the first half, only to see New Foundations find five of its own in the second. Two more from Kensington ensured a 6-5 win, which is a score that any fan of attacking soccer likes to see. Benjamin Franklin and Kensington continue undefeated. The teams play near the end of the season, and if they continue with their current form, we’ll see a regular season final game to decide first place.